of your vehicle. This forces the wire to draw more current than it should, which warms it up and begins to melt the surrounding plastic insulation. If you smell something along these lines or worse, if you see smoke, you should definitely have your vehicle repaired immediately. The problem may be minor - and in many cases it is - but anything that burns in your vehicle can quickly become a potentially dangerous problem. Dimming lights anywhere on your vehicle may indicate battery or electrical system problems. If it is the only light that gives you trouble, it's probably just a light bulb - but when replacing a light bulb after a new one does not solve a problem, wiring or components could be wrong. 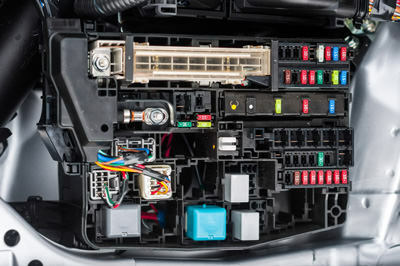 Stereo or a number of other electronic components found in newer vehicles such as GPS or even small TVs are great achievements but attract more power and thus increase the demands of your vehicle's electrical system. If one or more of these components are not functioning properly or do not work at all, there is a good chance that wiring or other components may fail, although in many cases the problem may be as simple as a blown fuse. Corrosion on the battery terminals or cables looks like a white or bluish buildup. If the corrosion is minor, you can try to remove it yourself with a chemical cleaning solution. The battery, connectors and cables are not only cleaned, but also sealed to extend the life of the battery. This, of course, is the most problematic of all electrical problems. If the engine does not spin, it usually takes longer than usual and the problem can be reduced to the battery or the starter. Many drivers fear that the teething troubles may be related to the engine itself and are relieved to learn that a completely independent electrical component could cause the problem. Keep an eye on these frequent warnings of electrical problems in the car and avoid interrupting daily commuting. In many cases, electrical problems are easy and relatively inexpensive to fix.